One of the games that I loved the most growing up was Final Fantasy 2 on SNES. In many ways it is the prototypical roleplaying game: you play a warrior protagonist in a medieval world, collecting items and equipment as you slay monsters and journey toward the source of ultimate evil. You defeat him, save the world and the story ends. It has been well over 20 years since Final Fantasy 2 was released, yet virtually every roleplaying game since then has used the same formula. The roleplaying genre is one that is notoriously stuck inside of its own mythology. So when something breaks out of that pattern, it gets attention. Undertale is a highly unconventional roleplaying game which discards most of the legacy that games like Final Fantasy have left for it. 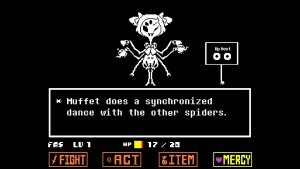 Genre conventions that remain are turned upside down in Undertale, so the game is as much a story and experience in itself as it is a commentary on the RPG genre. You play Chara, a human who travels through the subterranean monster world seeking a way to to return to the human world. In a genre filled with deeply entrenched conventions, it is a breath of fresh air. In Undertale, the world is populated by humans and monsters. Monsters exist in a subterranean world which is separated from the human world, and the two do not co-exist. You play a silent protagonist with an unknown sexual identity (I played the game thinking I was a girl before realizing that it had remained ambiguous for the entire game). As you journey through the monster world, you make friends and enemies and witness head-spinning weirdness. This is one of the weirdest games that I can remember playing. What’s so enjoyable about Undertale is that unlike other games in this genre, it doesn’t take itself seriously, and it takes incredible risks. As you may have already heard, these risks were worth taking, and contributed to Undertale being widely considered one of the best and most surprising games of 2015. One much talked-about feature of Undertale is the ability to complete the game without killing anyone. Without revealing too much about the “reveal” in Undertale, the game is about morality and perspective. Weighty themes for a retro roleplaying game to be wrestling with, but it gracefully manages them. At around six hours, the length of this game feels just right. I am intimidated by the time commitment that most RPGs demand (20-30 or more hours is not uncommon) and I do not find a longer game to be a better game. I love games get straight to the point, in 10 hours or less, and that is what Undertale does. I have spoken to a few friends who completed Undertale and went straight back into the game to complete it again with a different ending, so replayability is there. I may do that after a year or more, when Undertale has faded from my memory. For now, it was a bizarre odyssey into a monster world that was nothing like I expected it to be. Highly recommended, especially if you played roleplaying games in the 1990’s.